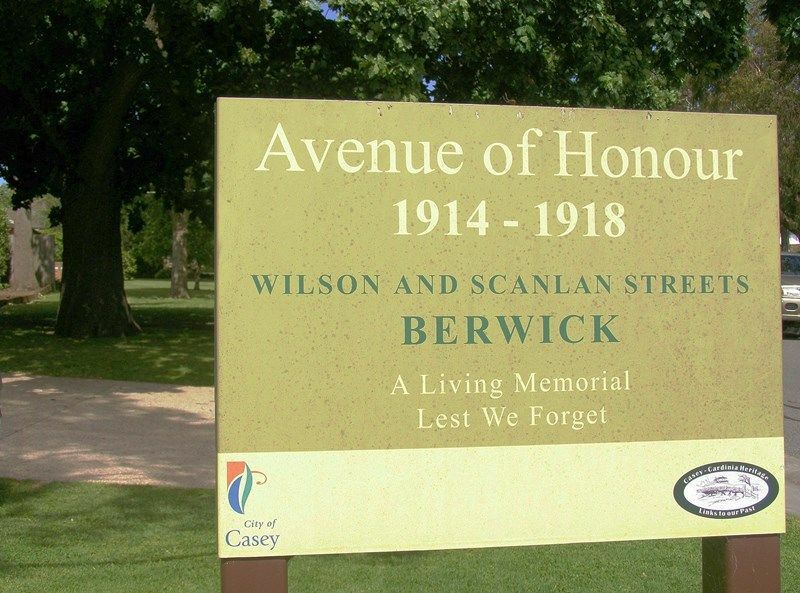 The Berwick Avenue of Honour with approximately 35 English and Pin Oaks was planted in September 1917 to commemorate those who had served in World War One. It was co-ordinated by the Berwick Progress Association with trees and tree-guards donated by Berwick residents. Gaps in the avenue have been filled with various species and the tree guards no longer exist. The planting of the Avenue of Honor was commenced on Saturday afternoon. Wilson street (the site chosen to commemorate our soldiers by planting trees in their honor) looked quite animated with the gathering of those interested in the proceeding. In all, 35 trees were planted, and the remainder will be completed during the week, when the full list of soldiers to whom trees have been dedicated will be printed. Cr W. G a'Beckett, in planting the first tree in the avenue, made a telling speech on the great lesson to be learnt from the planting of these avenues.